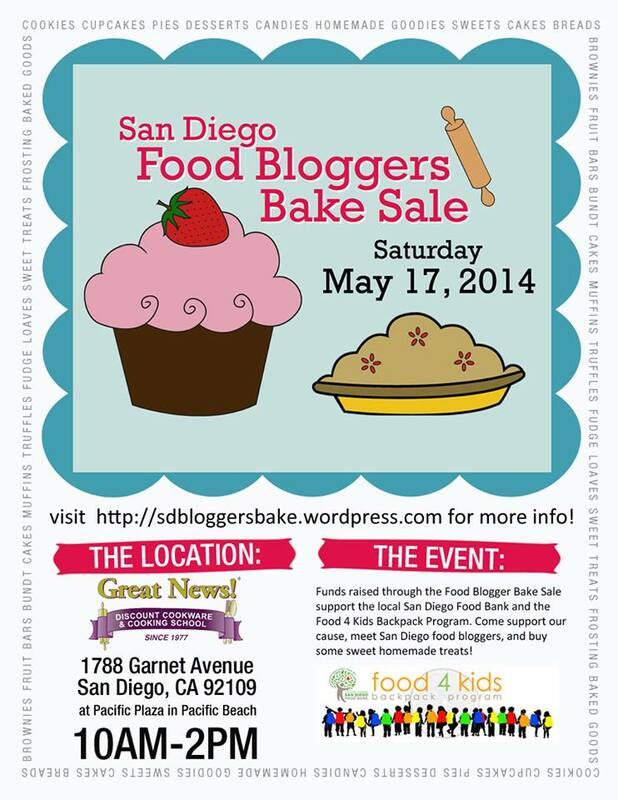 Another year, another great bake sale for the San Diego Food Bloggers. I participated last year, but I wasn’t there to see all of the action. This year I was able to watch it transpire. It was fun to see so many friends and random people filling grocery bags full of desserts. Awesome job!! I’m still waiting for the final amount raised for Share Our Strength‘s No Kid Hunger campaign. However, the sale isn’t officially over. You can still make a donation on-line. If we raise the most money, Duncan Hines will donate an additional $10,000 to our total! Atlanta has been winning this bake sale every year, and we, the San Diego Food Bloggers, would love to put an end to that streak! 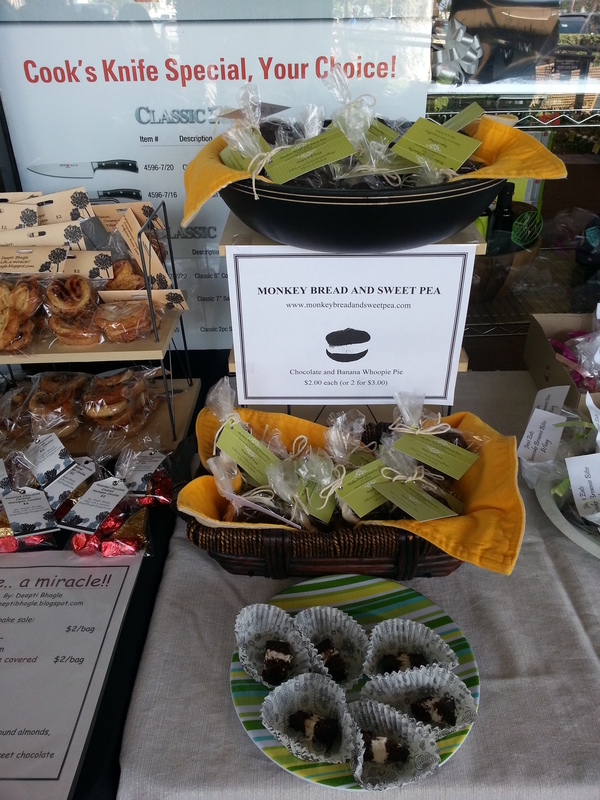 If you can, please go to http://join.strength.org/goto/SDFBBakeSale2013 and make a donation. Thank you so much for all of your help!!! This year I opted to make Chocolate-Banana Whoopie Pies. Choosing what to make is a daunting challenge. I wanted to make something that would appeal to the most people, and something that can be consumed on the spot or in a couple of hours. 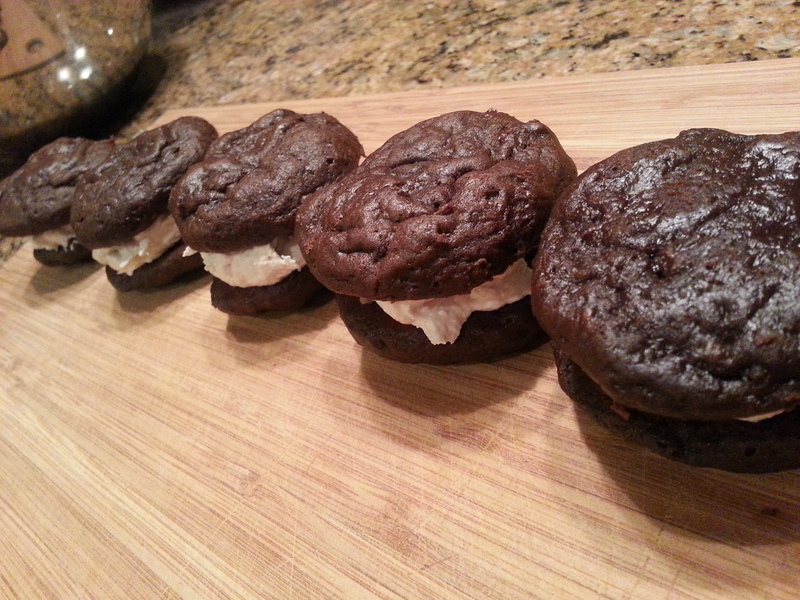 Chocolate is always a big hit, and once I saw a preliminary menu of what other bakers were planning to bring, I made the decision to make Whoopie Pies. Sadly, I’d never made them before. I looked over various recipes, and decided upon one from Good Housekeeping, February 2012. In medium bowl, whisk flour, cocoa, baking soda, and salt. From bananas, mash enough for 1/2 cup; finely chop remaining, and reserve. (**I mashed 1 banana, and I chopped 1 to add to the filling.) In another medium bowl, mix mashed banana, sour cream, and vanilla. Whip first 4 ingredients together. Fold chopped banana into filling. Fill sandwiches with as little or as much as you like, or just eat by the spoonful. It’s all good. I preferred the pies after they had been refrigerated. In general, I would suggest to keep the pies refrigerated. On another note, it was my brother’s birthday on Monday. Brian turned 50 on Monday. A HUGE “HAPPY BIRTHDAY! !’ goes out to him. Even though a few miles are between us, I’m thinking of you!! I hope this is a great year for you, Brian. 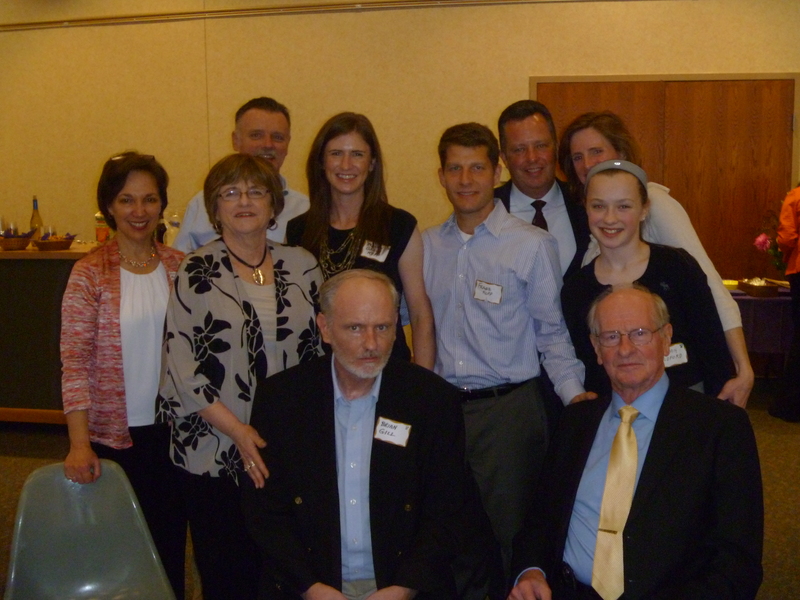 The photo below is from my dad’s 80th birthday last year. I picked the photo below for 2 reasons: 1) Brian was looking quite dapper and 2) for all of the special people present in the photo. The best birthday wish is to be surrounded by people you love. Take Care and Happy Eating (and Please Consider Making a Donation)! Happy Friday! I’ve decided to dedicate Fridays to a particular thing (food related, of course) that I have just loved throughout the week. I feel like Oprah! 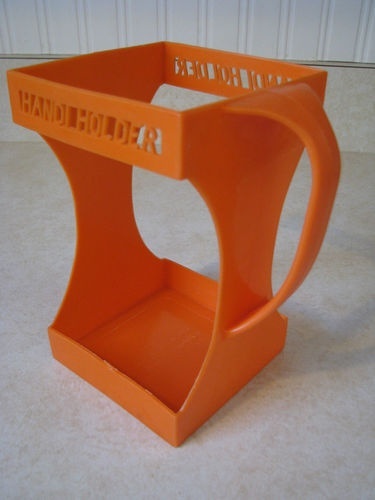 Unfortunately I will not be giving away my favorite things to my readers. I wish. Sorry. My favorite and fabulous thing this week is: Cooking Light Magazine! You get a subscription!! And you get a subscription!!!!!! And you – wait. I’m not Oprah. Again, I apologize. After Thanksgiving, Franz and I were still craving something sweet. I know, I know. We had left over pumpkin pie and a cranberry/rhubarb cobbler, so we should have stopped at that. We couldn’t let the craving go. 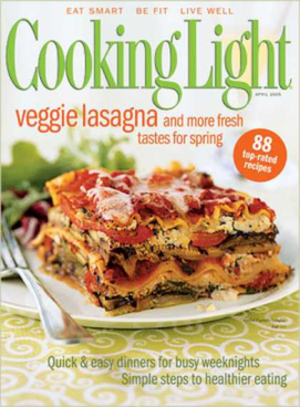 I had the latest copy of Cooking Light staring at me. Sir even used it as a head rest. I usually cook dinner Monday through Thursday. And of those dinners, about 80% or more come from Cooking Light. I even own The Annual Recipes 2009 and 2010 Cookbooks. The recipes are almost always tasty and relatively healthy. Occasionally I may tweak a recipe, but it usually isn’t necessary. The November cover photo is a slice of Baked Chocolate Mousse Cake. I ran to Trader Joe’s to purchase 2 items I needed to make this devilish dessert: instant coffee and some whipped topping (Cooking light suggested a reduced-calorie whipped topping, but I opted for regular.). I had everything else on hand. Word of advice: always have ingredients on hand to make at least a simple cake or a batch of cookies. It’s the only way to live. Once again, CL did me proud! It was easy to make, and it was delicious! Here’s the recipe . . .
OR USE WHIPPED CREAM: If you substitute an equal amount of whipped cream for the whipped topping, you’ll add 62 calories, 6.7g fat, and 4.2g sat fat to each serving. You will also need to bake the mousse about 5 minutes longer.